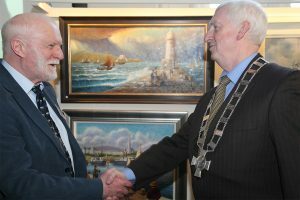 The launch of the Dublin Painting and Sketching Club’s 139th Annual Exhibition took place this evening (2/5/2017) in the National Maritime Museum of Ireland in Dun Laoghaire. 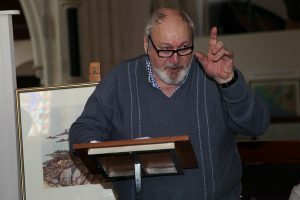 The show was officially launched by Maritime Historian Cormac Lowth. The exhibition incorporates a ‘Maritime’ theme, saluting the Dun Laoghaire Harbour Company’s celebration of the 200th Anniversary of the laying of the foundation stone of Dun Laoghaire Harbour and its East Pier, and marking the Club’s connection with Dun Laoghaire nautical activity, which goes back to the 1880s. So it seems fitting that the launch took place in the National Maritime Museum of Ireland. Members exhibiting include Margo Banks, Patrick Cahill, Betty Christie, Fergal Flanagan, Bridget Flinn, Edward Freeney, Michael Gemmell, Olivia Hayes, Tomas King, Vincent Lambe, Pamela Leonard, Padraig Lynch, Tom Roche, Tom Scott, Tom Ryan PPRHA and Club President Aidan Hickey. 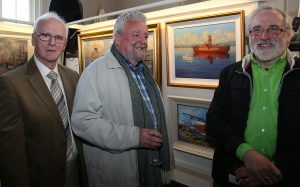 The exhibition will take place in the Concourse Gallery, Marine Road, Dun Laoghaire from 8th – 21st May. For more information see www.dublinpaintingandsketchingclub.ie. No user commented in " Launch of the Dublin Painting and Sketching Club’s Annual Exhibition "